Weekends Count Magazine - Education & Family Travel: 10 Millennial Friendly Items Your Hotel, City, or Airport is Missing! 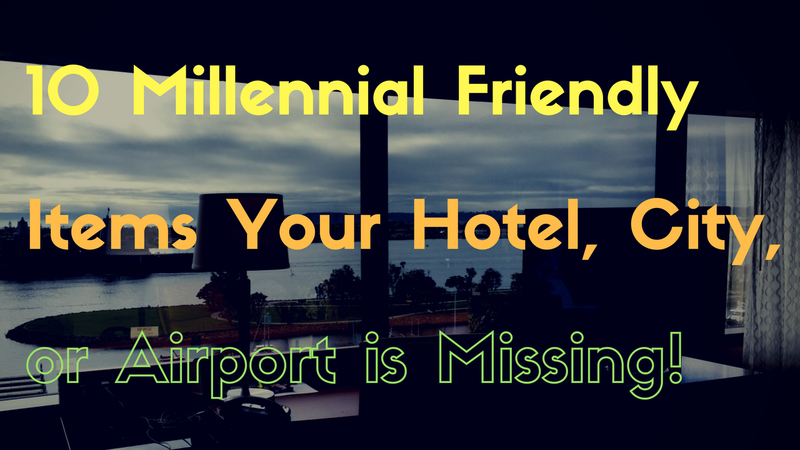 10 Millennial Friendly Items Your Hotel, City, or Airport is Missing! 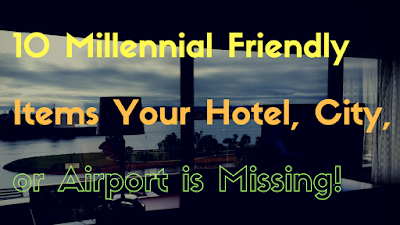 As a millennial traveler for business and personal purposes, I value extra amenities available in airports, hotels, and shopping plazas! If you think about the needs of Millennials, we usually travel with our digital devices which feature money-saving loyalty apps, enable us to engage on social media with those around us and those who were not fortunate to join our journey, and allow us to check-in before we arrive to our destination. This feature enables millennial travelers to chose our own customized, personalized experience when visiting a hotel. Based on the mobile app, we are able to: check-in the day before we actually arrive to the destination, choose the time we would like to have our room ready (which is GREAT for an early morning arrival), and choose when we would like to leave! Some loyalty programs actually enable us to choose a 4pm check out time! I LOVE THIS! Mobile apps like Starbucks and Dunkin Donuts enable travelers to order their meals ahead of time, notify the restaurant when they would like to pick up the meal, pay for the meal via the app, and then the best part - EARN POINTS! 3 - Hotel and Airport Lounges! "free food", and document this coveted experience on social media. Millennials like access to outlets throughout their hotel rooms and airports when they are on the go! Yes, this seems like a college or university concept (to have outlets everywhere), but as a college professor, I LOVE these as well! I am always on the lookout for USB outlets for my various devices! I know that this seems like a given, but Millennial travelers (and everyone else) appreciate free wi-fi and we are willing to give surface-based personal information or walk a block or more to take advantage of this amenity! As Millennials, we are all about the local experience and we do not want to embark on a long journey to have these experiences. We want the experience to come to us! This is definitely true for millennial business travelers and millennial families. If a tour departs from our hotel, we are more likely to take it! I am a fan of Grayline Tours, because they are safe, reliable, and they are located in many cities, states, and they also have international tours! Yes, millennials are all about the local experiences, but this also includes local food fare! So, if it is too cold, too hot, too rainy, or too stormy to experience the local environment, we will definitely try the local food and brag to our friends about how great the local [insert local food or beverage item here] was and how others who are visiting the area should try it! Yes! This has been one of the most amazing items that I've experienced as a millennial traveler. It is just like watching the Internet at home. I just log-on to my YouTube account, Hulu account, or Netflix and I am able to watch all of my shows from the comfort of my own...hotel room! We use Amazon at home and we would like to have access to all of the snacks that we had to leave at home due to packing our TSA and airline compliant luggage. For example, I have Smartwater nad snack bars delivered to my home each month to prevent an additional trip to the grocery store. Hotels should highlight the Amazon delivery address or nearest Amazon locker on their website! Our entire existence has been focused on learning. Why stop learning when we are on the go with our businesses or with our families. The Atlanta Marriott Gateway Hotel highlights TED talks on their website and on the Internet TV in each room. The Atlanta Hartfield airport features various learning opportunities for travelers by having several National Park Service kiosks with actual artifacts in their terminals. This was a great learning opportunity for each member of our family. Also, the kiosks enabled us to engage with the exhibits via QR codes and also through a common hashtag I learned a lot!